About 80 percent of us experience “email apnea”—the habit of holding our breath when we open our inbox—and who can blame us? Each day we’re inundated with hundreds of email messages, all contending for our attention. Sure, there are third-party email managers that will filter, sort, and prioritize your messages for you, usually for a fee. 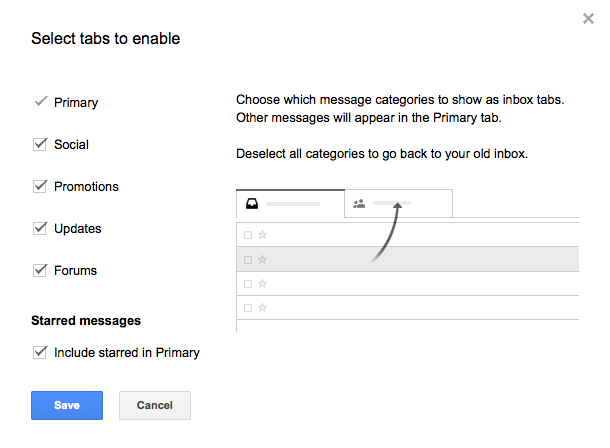 But if you’re a Gmail user, you already have plenty of tools at hand for taking back control. Here are five ways you can start today. As any productivity nerd knows, it’s keyboard shortcuts that put the “power” in “power user.” Because your fingers never have to abandon the keys to use a trackpad or mouse, keyboard shortcuts let you navigate your inbox more quickly and accurately. By default, Gmail has several shortcuts enabled, including “Send message,” “Advance to next Window,” and “Add CC recipients.” Turn on the full complement for maximum effectiveness. Press Shift–? to access Gmail’s keyboard shortcut guide. To do so, click the gear icon at the top right of your inbox, go to Settings > General > Keyboard shortcuts and select the radio button next to “Keyboard shortcuts on.” Remember to save your settings. If you can’t remember a shortcut, just press Press Shift–? to open the built-in cheat sheet. Important first—With this inbox style, Gmail predicts which messages are most important to you based on your email habits, tags them with a yellow marker, and puts them at the top of your inbox regardless of when they arrived. 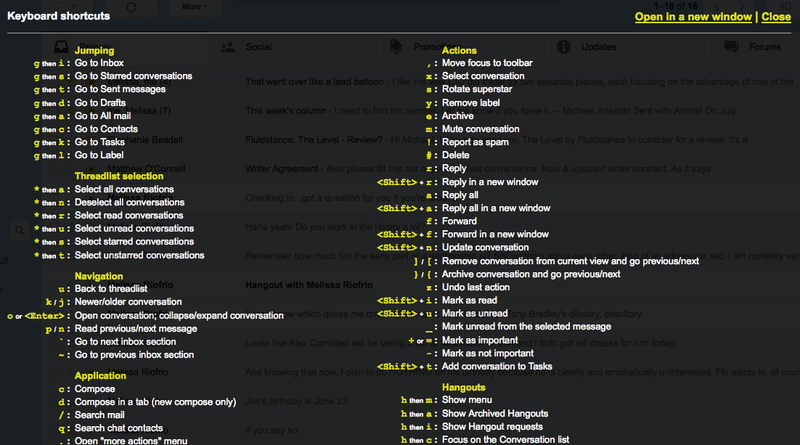 Unread first—This style surfaces all unread messages to ensure nothing falls through the cracks. Starred first—If you use stars to manually prioritize important emails, this option will make sure those emails are always at the top of your inbox. To change your inbox sorting method at any time, hover over “Inbox” in the left navigation bar and click the arrow to access your options from the drop-down menu. 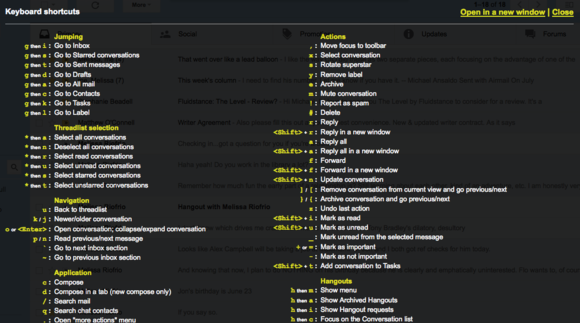 Experiment with Gmail’s preset inbox styles to find one that works for you. If you prefer to use Gmail’s default timeline style, you can impose some order by enabling Categories. This will sort your email by type into five sub-inboxes: “Primary” for personal messages; “Promotions” for deals and marketing offers; “Social” for alerts from your social networks; “Updates” for receipts bills, statements, and confirmations; and “Forums” for messages from discussion boards and mailing lists. These inboxes are accessible through tabs placed at the top of your main inbox. Turn on Category tabs to sort incoming messages into sub-inboxes. To enable categories, make sure you're using the Default inbox style, then click the gear icon and go to “Configure inbox.” In the overlay that pops up, select the tabs you want to use and click Save. As we mentioned earlier, when you see a little yellow marker next to a message, you know that message is important. Conversely, a clear marker denotes that message is less urgent. But those markers can tell you even more if you enable Gmail’s Personal Level Indicators. This feature will place arrows inside that marker to let you know whether a message was addressed to just you (single arrow), to a group (double arrows) or a mailing list (no arrow). To enable this feature, click the gear icon and go to Settings > Personal level indicators, and select Show indicators. Click Save. If you’re using labels to organize your content—and you should be—you can make them even more useful by customizing the left navigation bar to provide direct links to them. Gmail provides three display options for label links: “Show,” “Hide,” and “Show if unread.” The last is probably most helpful for restoring sanity to your inbox, as a label link will only show up in the left navigation if it contains a message you haven’t opened yet. To customize link settings for each of your labels, click the gear icon and go to Settings > Labels.